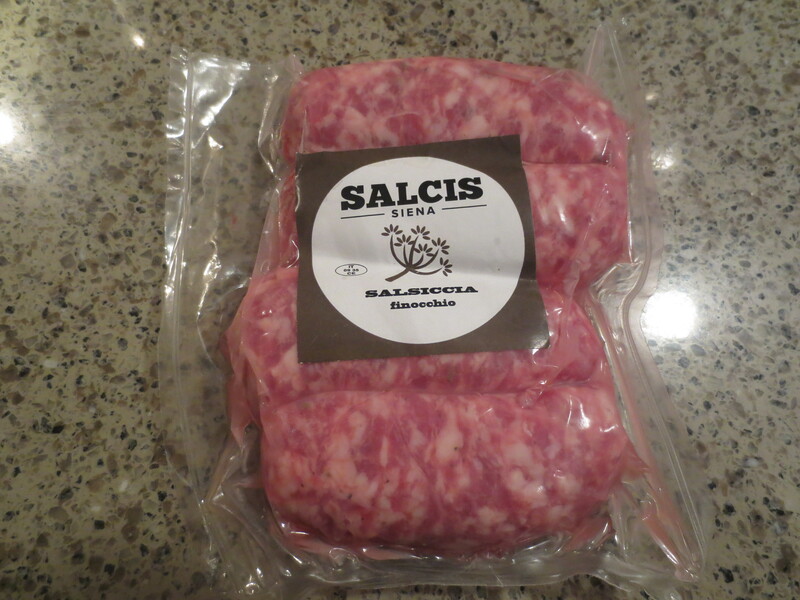 I rarely eat sausages these days (they were a regular supper dish when my kids were small) but a few times I’ve sought out good, authentic Italian sausages for a dish and had no luck finding any. Then the other day I was in Corto Italian Deli buying more taralli – a serious addiction of mine – when I saw some wonderful-looking sausages in their fridge. Wow! I exclaimed. They looked fantastic. They come from Siena, Romina told me. They looked so good, I had to buy some. These Tuscan sausages are 95% pork meat, flavoured with fennel seeds (though Romina did give me a choice; she had chilli ones and other flavours). I felt I had to do something special with them. I made my own sausages last New Year to serve them, Italian-style to welcome in the new year, with lentils. I thought of Italian dishes where they’re served on a bed of roasted pepper slices with onions and tomatoes. Then I found a recipe in Two Greedy Italians in which Carluccio gives a recipe for homemade sausages with a red pepper sauce. 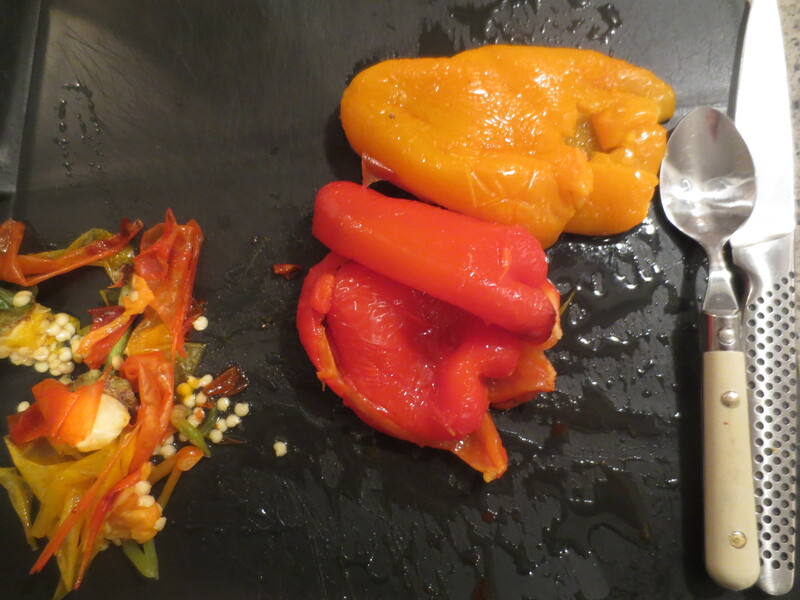 Well I wasn’t planning to make my own sausages tonight, of course, but the pepper sauce sounded great. And I decided to serve some polenta flavoured with butter and Parmesan with it. The first thing I did was make the sauce. In Two Greedy Italians Antonio Carluccio calls this pepolata sauce. 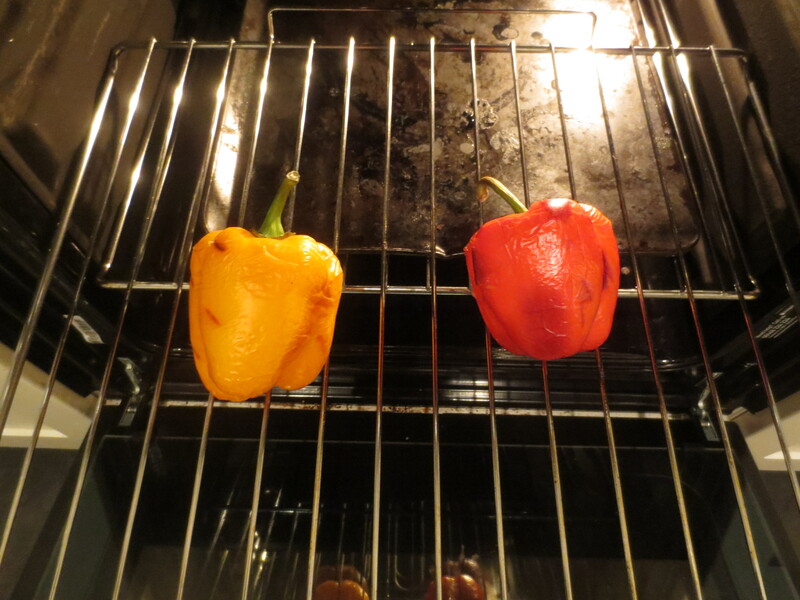 I halved the recipe and rather than griddle my peppers as he does to get the skins off, I put them into a hot (220/200 Fan) oven for 20 minutes until they were starting to blacken and I could see the skin popping off. 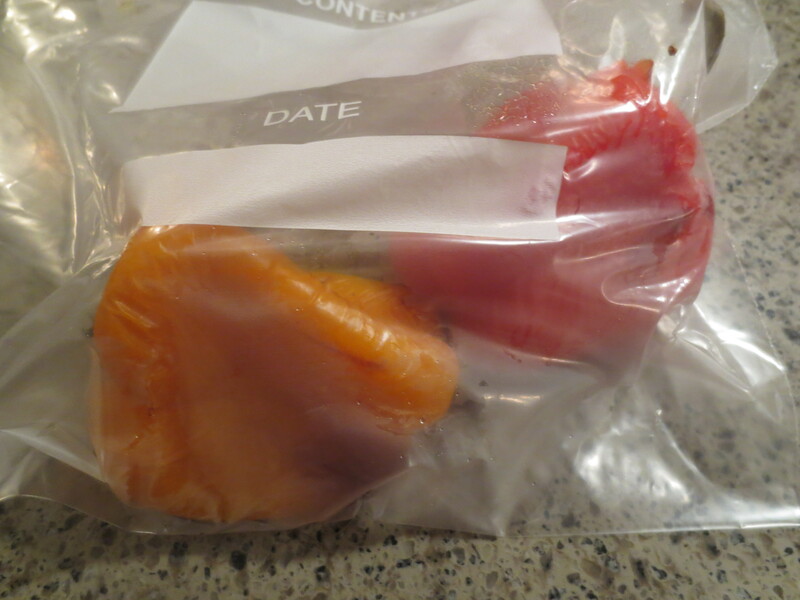 I then placed them in a freezer bag and sealed it, leaving the peppers until they were cool enough to handle. I took them out and the skin peeled off easily. You also need to remove the seeds. 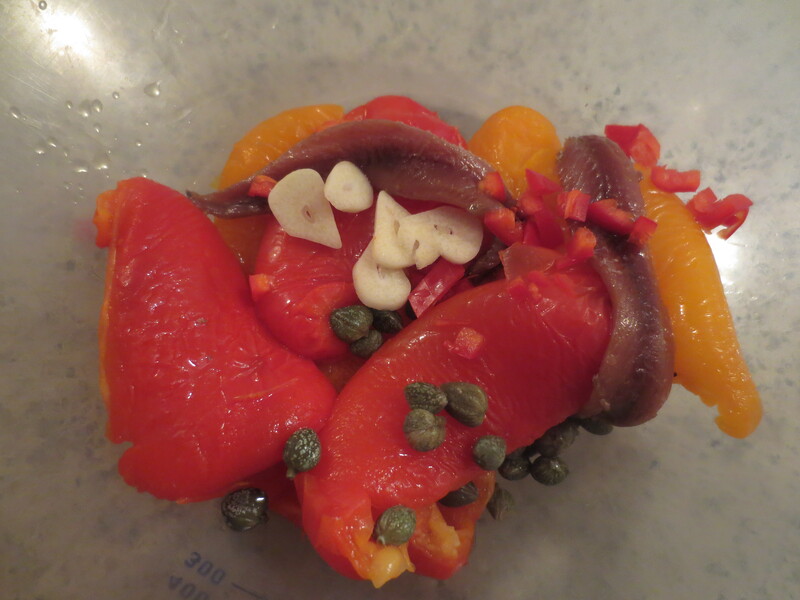 Now place the peppers in a bowl or jug with ½ tablespoon salted capers (which you’ve soaked for 30 minutes in water, then drained); ½ garlic clove, sliced; ¼ red chilli, finely sliced; and 2 anchovy fillets. Now blend with a hand blender (if you have the right size blender then use that! But my food processor is too big for this amount). 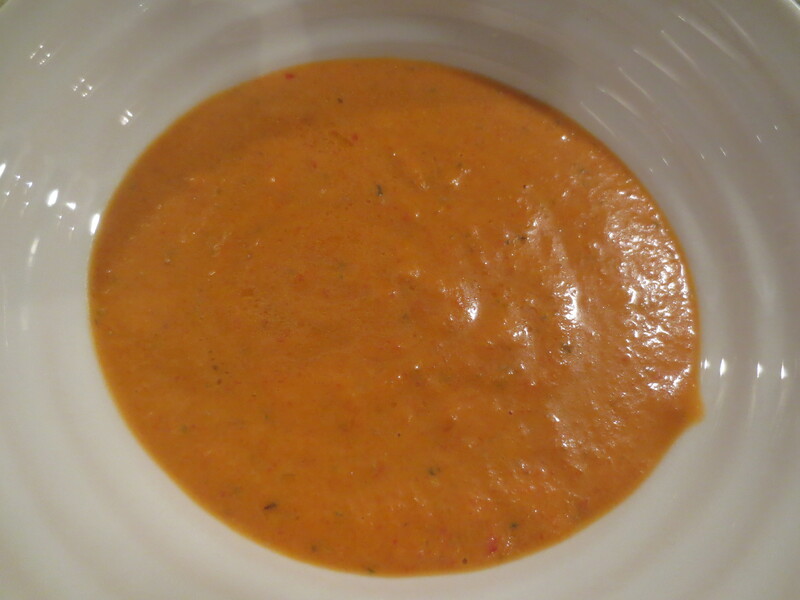 Once well blended, slowly add olive oil until you have a nice, loose sauce consistency. Taste to check seasoning. I didn’t need salt because of the anchovies. 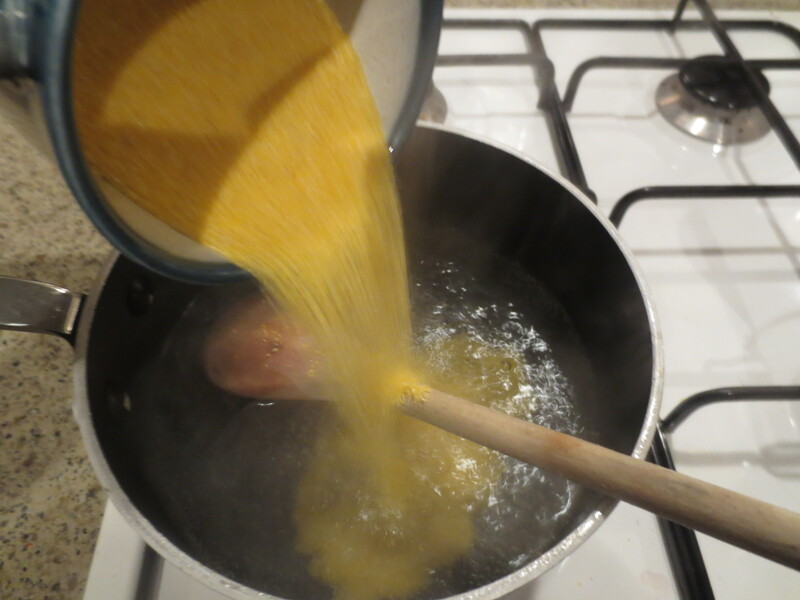 To prepare the polenta, bring some water in a pan to the boil with some salt. 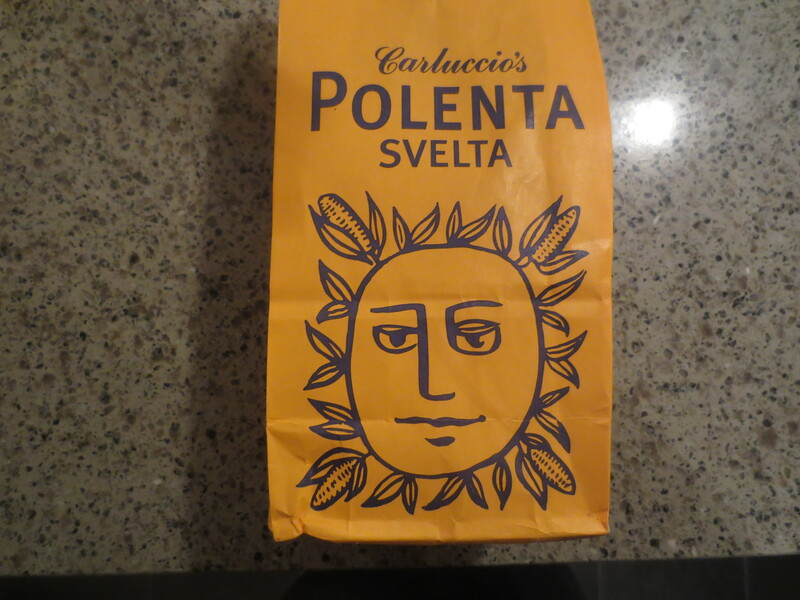 I used quick cooking polenta from Carluccio’s Caffe. It’s really good and when I tasted it, I almost didn’t bother to add the butter and Parmesan. Polenta can be so tasteless but this one is great. I worked out that I needed about 4 times the amount of water to polenta so did ½ cup polenta to 2 cups water. But you’ll need to check instructions on your packet. 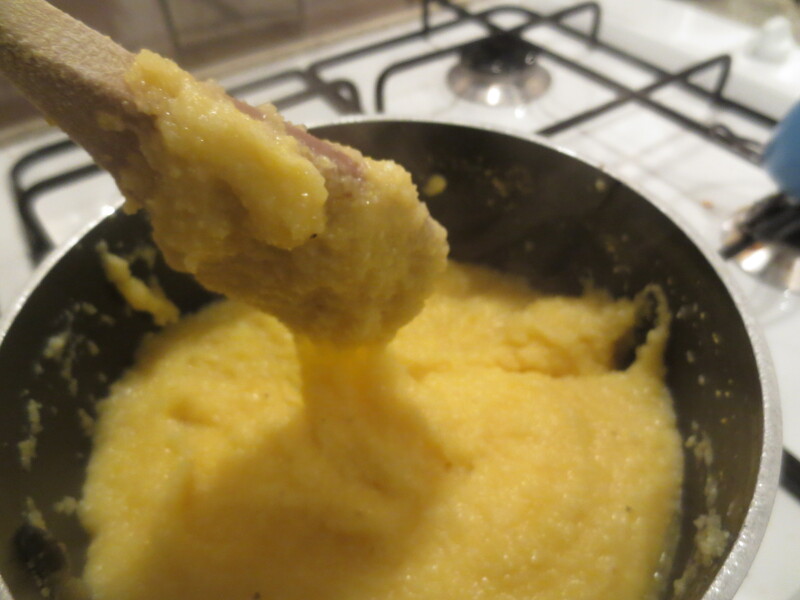 Once the salted water in the pan is boiling, slowly pour in the polenta, stirring as you go. I’m getting quite practised at this now and had no lumps, but if you do, remove from the heat and beat well till smooth. Stir until thickened but you want it to still be slightly sloppy. Now add a good lump of butter and generous grating of Parmesan and some black pepper. Beat together well. Meanwhile, have your sausages cooking by your preferred method. I like to grill mine. I decided to slice them and lay them on top of a bed of the polenta with the sauce served on top. On the side I had a green salad (and a glass of red wine!). I have to say that when I looked at it I thought it was a bit over-colourful and maybe I should have served the sausages and sauce with potatoes; used a less colourful plate. But hey! It’s been a grey and dreary day so what’s wrong with some colour? And most important, it tasted great. The sausages were fabulous: so meaty and tasty. The sauce matched them brilliantly (they were very similar to Carluccio’s homemade sausages in the book). 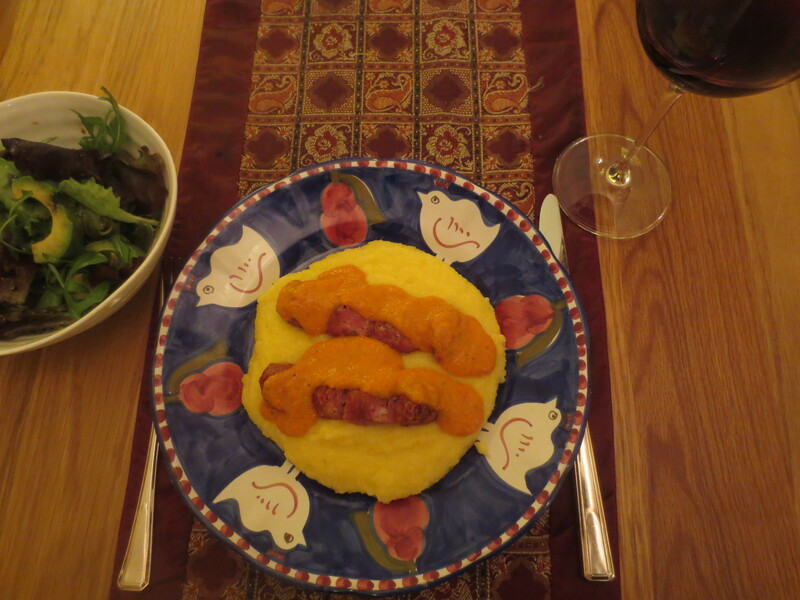 The polenta was my most successful attempt to date (I’ve not totally avoided lumps before!) and it all came together into a tasty, warming and sunny supper for the start of the week. All the color is wonderful! 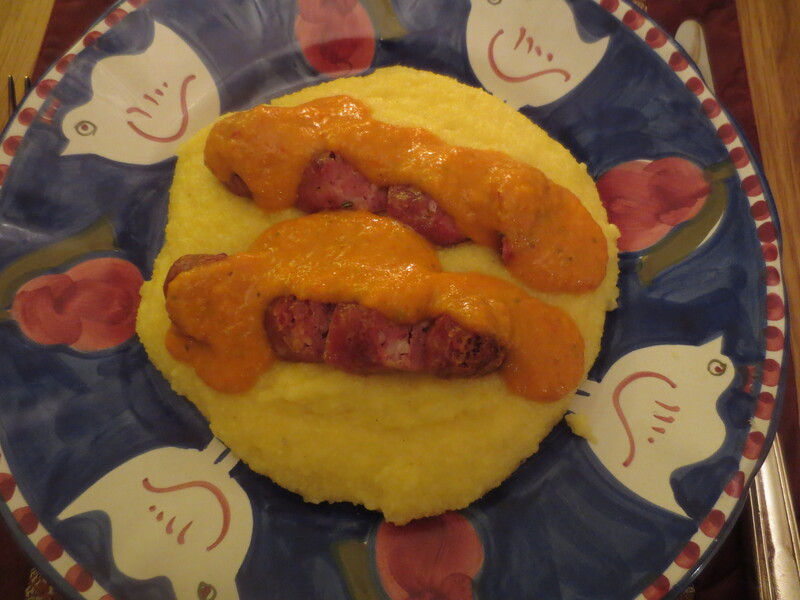 I love that roasted red bell pepper sauce – especially with the sausages and polenta. Fabulous!!! Thank you Mimi! 🙂 I wasn’t too sure about how it all looked but it tasted great! Those sausages look fantastic, I wish I could buy similar around here – bet they were delicious! They were! A great discovery – nothing like ‘ordinary’ sausages in UK supermarkets; so meaty and tasty.